Snowboarding has seen an increase in popularity with kids over the last few years. For the first generation of snowboarders, many who are now parents, it’s time to share their passion for this sport with their children. The snowboard industry has picked up on this trend and has introduced small-size specialised snowboards to fill the gap. 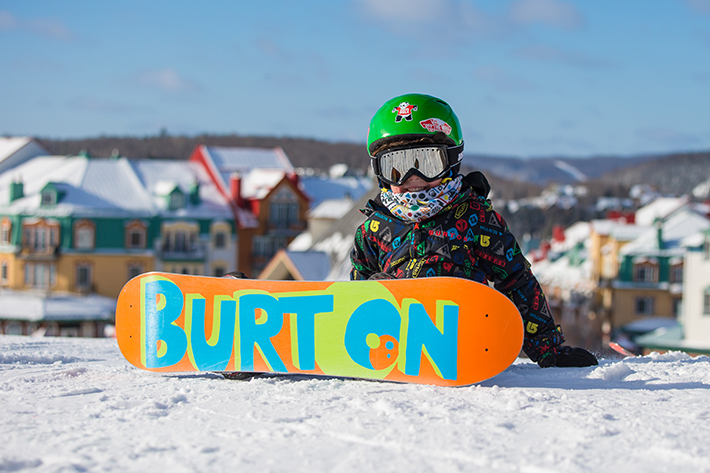 This April 3rd, Tremblant will be hosting the 9th edition of the Burton El Niño; a day entirely dedicated to young freestyle snowboarders. Young riders 12 years and under, newcomers to the sport or more experienced snowboarders, can participate. Have you seen an increase in the sales of snowboard equipment for juniors in the past few years? Yes. Since 2014, snowboard equipment sales have soared by 80%. This year, we have seen a small decrease in sales, but in general, the junior snowboard equipment market is thriving. Have you seen an increase in the offer for kids in this segment? Yes. We now have much more choice in kids’ snowboards for different levels. Whereas we used to only offer entry-level boards, we now have more options; especially in our junior boots and bindings selection. On average, at what age do kids start snowboarding? I don’t exactly know the average age of beginners, but if I look around me, kids are now put on a board as early as age 2, for both boys and girls. At that young age, we only want them to enjoy the sport and develop their passion for playing outdoors. We have to keep expectations low, never ask for a perfect run… It’s all in the name of fun. That’s the heart and soul of this culture! Have you seen an increase in the number participants in the Burton El Niño event? For the past 3 years, we’ve seen a 45% increase in the number of participants to this event. While age requirement used to be 14 years old, we have now added a category for 12 year-olds and under. How do you see the future of the junior snowboarding segment? At the ski area’s shop, we are continually increasing the offer in the junior segment and are also offering more and more snowboard clothing and equipment. We are more than ever promoting the El Niño event to mix fun with education. We’ve also been partnering with a young local snowboarder, Charles Pratte, for three years now. He’s been with us since the age of 14. We believe in the next generation! Kids are the ones who will bring back the glory of snowboarding! All in all, we can see a steady increase in the practice of snowboarding among kids, on the slopes, in store and even on Facebook and YouTube. Ride on little ones!